HURUNGWE, Zimbabwe- A group of toddlers laugh excitedly as they play with water and dirty at a borehole near a small village in Zimbabweâ€™s Hurungwe district. For the young children the borehole was a source of entertainment more than a point of nourishment for thirty humans and livestock. And to the childrenâ€™s parents working in a nearby maize field, the borehole brought relief from the disturbance on the crops the children could have caused had they not have such a distraction. The children pumped water into small plastic containers; screamed elatedly as they spray each other with water. But a few years ago such extravagance with water by the children could have brought harsh reproach from their parents as the borehole was almost running dry back then. However, the borehole now has lot of water after it was refurbished with the support of a private company, Carbon Green Africa under the Kariba REDD+ project. Carbon Green Africa, developed KARIBA REDD+ in four districts namely Binga, Nyaminyami, Hurungwe and Mbire, with a focus to reduce deforestation and degradation of the forests through appropriate management. And more than 200 boreholes in these four districts have been refurbished or drilled through funding from the projects. â€œThe boreholes now has plenty of water for us and our livestock,â€ Hilda Chahwanda said recently. â€œSome women were travelling more than 10 kilometres to get water,â€ Carbon Green Africa CEO, Charles Ndondo said. â€œWe are trying to lessen that burdenâ€. Climate change induced droughts have ravaged the country in the past decade and many water sources have gone dry. The droughts have left many people in the rural people particularly women travelling long distances to get water. 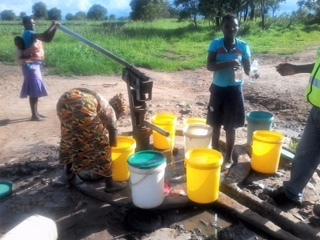 The programme by Carbon Green Africa to rehabilitate and drill new boreholes in the four districts in Mashonaland province dovetails with efforts by the government to provided clean water. Zimbabweâ€™s Finance and Economic Development Minister, Patrick Chinamasa acknowledged the impact of the past droughts provision. Though Chinamasa said the government was working towards insuring the availability of clean water to rural people through the rehabilitation of broken boreholes and sinking new ones, the government is however constrained by the shortage of financial resources. He said the government appreciated the reality that water was essential for other things such as producing food, maintaining hygiene, and even securing livelihoods, as such the right to water was indispensable. â€œWe cannot combat disease and malnutrition without ensuring adequate provision of nutritious foods and clean drinking water,â€ Chinmasa said. And the Cancun Agreements (http://unfccc.int/files/meetings/cop_16/application/pdf/cop16_lca.pdf) clearly states that REDD+ was not only about reducing emissions but halting and reversing forest loss. The agreement emphasised that REDD+ actions must result in maintaining existing forests and carbon stocks and encourages all countries to find effective ways to reduce the human pressures on forests that result in greenhouse gas emissions. And as such besides providing clean water, Carbon Green Africa also initiated various projects in these districts. â€œThe local communities own the project whose lives have been substantially improved in regards to many facets such as health care, education, water and sanitation, employment, and quality agricultural techniques, thus empowering a portion of the population that require equal opportunities,â€ Ndondo said. For the past five years, has helped to reduce deforestation in the project area thereby saving thousands of forest land. Every year, Ndondo said, 1 200 Farmers are trained on conservation agriculture where necessary material inputs are provided. And to date over 6 000 farmers have benefited and over 700 Kenyan Top bar bee hives have been distributed to community members after trainings.Â Disadvantaged children have had their school fees paid for. â€œMoringa tree plantations have been set up and more herbal trees can be set up subject to funds availability. The projectâ€™s biodiversity benefits include a reduction of the poaching on wildlife through regular patrolling, in cooperation with the local RDCs (rural district councils)â€, Ndondo said. However he was quick to add that project received private funding investment until the successful issuance of carbon credits which are now on the voluntary market. â€œThe project is now expected to be running the projects from proceeds of the credit sales,â€ he said. â€œThe major challenge is on the slow uptake of the credits on the voluntary marketâ€. Zimbabweâ€™s National Climate Change Response Strategy draft of 2013 outlines strategies to implement legal frameworks and policies for REDD+ and carbon financing. According to the Grantham Research Institute on Climate Change and the Environment, strategies include identification of lands subject for carbon management, developing government capacity to handle carbon financing mechanisms and measurement, reporting and verification of carbon stocks, promote livelihood enhancement activities to reduce rural populationâ€™s dependency on forests and forest products, and build capacity of local financial institutions to support carbon finance transactions. However, Ndondo said the community projects were operating below level due to limited sales of the carbon credits. â€œThe financial resources cannot meet the demand. If you buy our carbon credits, you have not only offset your carbon foot print towards the Environment,â€ he said. â€œSo participation to this project is a double barrel; namely climate change and uplifting the communityâ€. This story was written under the aegis of the CSE Media Fellowship Programme.